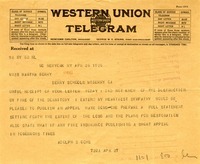 Ochs has just learned of the dormitory fire and offers to publish an appeal for funds. 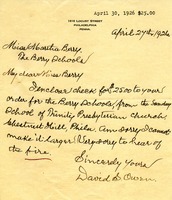 David writes to Martha with a check for the Berry school, sorry to hear about the fire on campus. 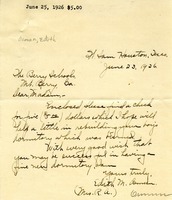 A letter asking for donations to rebuild the boy's dormitory that burned down. 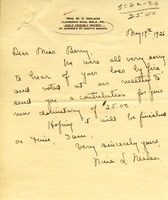 Miss North returned the letter with a donation. 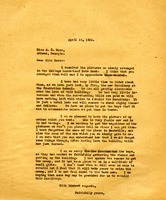 Morris encloses a donation in response to the dormitory fire solicitation and asks that John I. Mills be added to the mailing list. Mrs. Neilson writes in sympathy for the dorm fire and enclosed a check for 25 dollars from the Girls' Friendly Society at St. Andrew's St. Asaph's Branch. 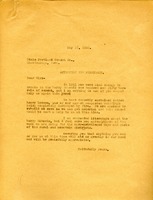 Mary writes to Martha to inform Martha that the letter about the dorm fire has reached her. Mary notes that once she gets taxes paid and a few other debts that she will send something to help. Letter informs her friends of the Foundation School dormitory fire which left 75 boys unhoused, she discusses the intent to rebuild as soon as possible in order to keep these 75 boys in school come September. She explains the need of support to fund the preferred fire-proof replacement dormitory. Mrs. Mulligan sent $20. 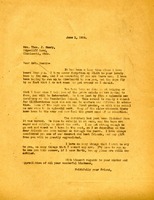 Martha Berry remembers visiting Mrs Emery's home in Cincinnati ,expresses an interest in visiting with her again. Martha tells about the boys that have lost their Berry home and the need of a new dormitory. 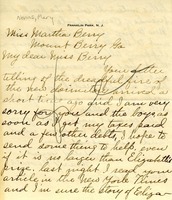 Martha Berry is unable to travel as she once did and is relying on her friends to meet Berry's need. 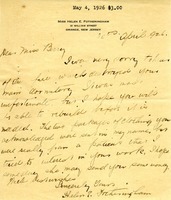 Martha writes to Mrs. Lawrence to tell her that they enjoyed her visit. She also mentions the Dorm fire on the foundation school. 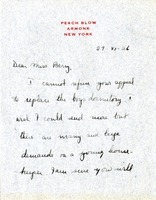 Helen writes to Martha expressing her sympathy for the lost dormitory and encloses a small donation to help the rebuilding. 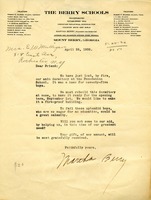 Letter from Martha Berry to the editor of the Greensboro Daily News appealing for help in getting a story and pictures of the Boys Dormitory Fire in the paper in order to solicit funds. 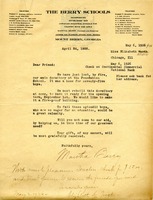 Martha writes to the president of Dixie Cement asking if he would be able to donate to the school after the dorm fire. 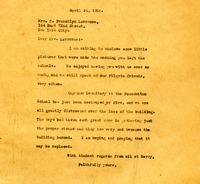 In this letter Martha Berry is asking Mrs. L. K. Elmhirst for a donation to help pay for the dormitory that recently burned down in a fire.